Historically, tapas (taken from the Spanish word ‘tapa’, for pot cover) were served by inns to weary travellers to offer a sampling of their menu. Later on, tapas were what sherry drinkers in Andalusia taverns used to cover their drinks in between sips, usually a slice of bread or meat, and this was done to prevent fruit flies from dropping into the sweet-smelling alcohol. Now, tapas are a small dish of food, with the intent of 1) offering a small snack in between meals (especially given the late Spanish eating time), 2) Accompanying a drink, or 3) as part of a large selection of food that gives the guest an opportunity to try many different dishes. Granada is one of the few major cities in Spain that still serves one free tapas with an alcoholic drink purchase, and more than the usual little plate of olives that comes free at a lot of Spanish restaurants. Upon ordering a drink, most tapas places in Granada that still abide by the traditional way of serving and selling tapas will ask you which tapas you would like with each drink order. This means the opportunity to try a lot of different tapas at a low cost – well, for as long as you can handle your liquor, anyway! As a tourist in Granada, you can do a “tapas crawl” which sees you going to a bunch of different places and trying one dish/drink per place before moving on, but here are my two favourite Granada tapas places that I spent several hours savouring every bite and sip. 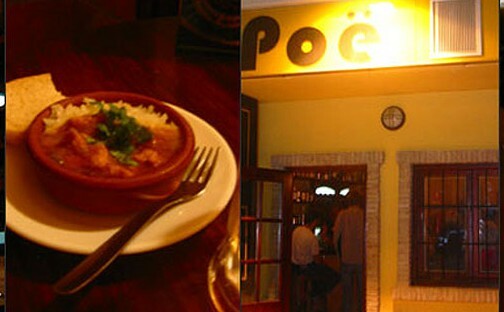 Bar Poë is ran by a British gent, Matt, and his Angolan wife, Ana, located in central Granada just off Calle Jardines and open 8 pm until late nightly. With every drink order, you choose your tapas, or you have the option of ordering a larger 1/2 or whole racione at a higher price. We ordered six Estrella cervezas, so it came with six different tapas, and the total price came to 12 Euro, which is incredibly reasonable for a European dinner. Our favourites from the menu were Bacalhau à Gomes de Sá (Portuguese style salt cod), Estofado de Carne con ‘Piri-Piri’ (spicy Piri-Piri pork stew), Galinha de Coco y Funji (chicken in coconut sauce with polenta), and Pollo en salsa Thailandés (Chicken in spicy Thai sauce), though everything we had was amazing. The tapas have an international influence, but one of the best things about Bar Poë is the atmosphere. Matt greets you like you’re coming home after a long journey, eager to share stories over a pint. This place continues the International trend, with tapas influenced by Asian, Middle-Eastern and Moroccan cuisine, with plenty of vegetarian options to boot (a rarity in Spain!). It’s located on Calle Elvira, a street filled with several other tapas places and Moroccan tea houses, and opens around lunch time until late in the evening. 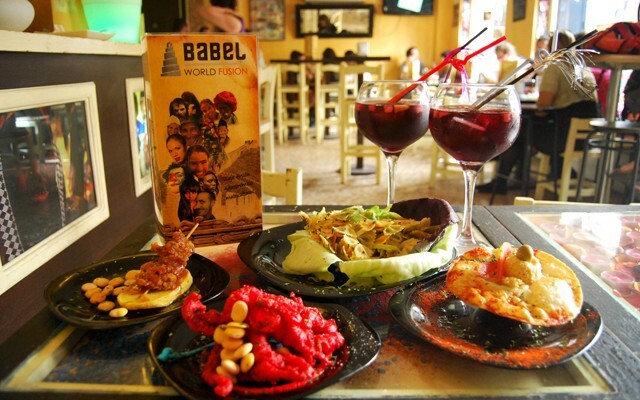 The name “Babel” holds true with all the internationally influenced cuisine, and the choice of decor in the bar. Popular with students, you receive a free tapas with every drink order (around 3 Euro/drink), and the menu is larger and more extensive than Bar Poë’s. The service was scattered but the food was delicious – a nice spin on traditional Spanish tapas. I enjoyed the Alitas BBQ (barbecued wings), the Risoto de queso, and the Moroccan meatballs. Sevilla is similar to Granada in that it’s not as expensive as Barcelona or Madrid, but it maintains a much more distinctively Spanish/Moorish air than the International vibes present in Granada (largely due to the student Erasmus program). The heat in Sevilla was enough to leave us winter-friendly Canadians exhausted after five minutes out of the mister, so we were able to score some tapas recommendations from the owner of our hostel, two of which we were able to heartily enjoy. I can’t tell what I liked more about Bodega Santa Cruz – the food or the atmosphere. You’re seated in a hot, non-airconditioned bar, where, in the Sevilla heat, it makes little difference if you choose an indoor or outdoor seat – order a cold beer and hope the best for your sweat glands. It’s loud, but the noise comes mostly from the bartenders yelling orders to each other and to the kitchen in the back. The bar is covered by lists written in chalk – each table’s orders are written on the bar and then wiped away when settled up. When your food was ready, they’d yell for you from the bar, and you’d scrape past the flying elbows of the crowded interior to get to your plates. Though there were tourists in the restaurant, there were lots of locals too, making the whole experience feel slightly more authentic. And my favourite dish from there, the solomillo al whisky – well, let’s just say I still have dreams about it. The unique presentation of tapas at La Azotea in Sevilla. La Azotea now has several locations in Sevilla, but its original is also in the Santa Cruz neighbourhood. It’s a bit pricier than the average tapas spot, but the prices are worth it; it’s also worth noting that if you want to order tapas and not off of their full menu, you have to sit at the bar. It’s also worth noting that bread and olives were extra, and not a free addition like many other Spanish restaurants. While La Azotea lacks the character of Bodega Santa Cruz, it makes up for it in quality of food and presentation. The roast beef burguer (pictured) came with a side of salad and roasted potatoes, and also inside a little mini take-out box – and it was delicious. My other favourite menu item was a cod dish that came artistically decorated with pesto and almond béchamel sauces – I’m not normally a seafood person, but this was absolute heaven.